Irish Garden House: A Great Look . . .
A Great Look . 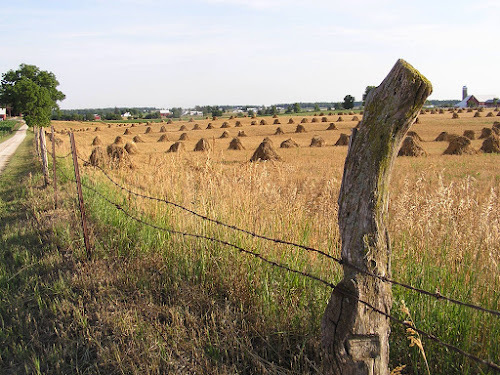 . .
Love the old fashioned hay stacks. Fall has always been my most favorite season, and seeing this picture sure warmed my heart.. thanks for sharing. Nice fence..MAybe a good subject for a painting!! Enjoy your day..
AMERICA THE BEAUTIFUL immediately came to mind....what a nice gesture it was for your friend to send you the photo. Simply beautiful..this land of ours! What a neat photo. I like the way the hay looks like tee-pee's in the field. How nice of your friend to send you the photo to share. LOVE it. looks like a rural Pa. shot. Beautiful! It looks like it is in Amish country.